The Counterfeit Sixties presents a showcase of the great bands of this unforgettable time. The fantastic music of The Beatles, The Rolling Stones, The Who, The Dave Clark Five, The Kinks and The Monkees – to name but a few – all recreated in this stunning show. The band members have performed their unique tribute shows all over the UK and abroad, and have a wide range of experience in that field. 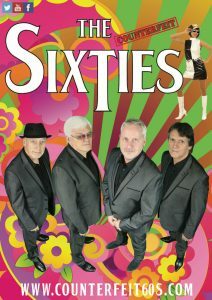 The members of the band have individually worked with notable sixties’ artists such as The Searchers, The Ivy League, The Fortunes, The Tremeloes and many more.